In preparation to the Hamburg Wasser World Triathlon the water quality of the swim course is regularly monitored by the independent institute of hygiene and environment and has to be accordingly to the official specifications of the ITU. Until the event weekend the measurements will be regularly published on this website. All measurements are due to be published two days after the water was tested. The water temperature is taken at the measuring station “Lombardsbrücke” where the temperature is constantly measured. The water temperature is taken every 10 minutes and the average figure as well as the maximum and minimum figure will be published. Please note: The figures have been updated on July, 13th 2018. Faecal coliforms and intestinal enterococci are found in the intestines of humans and animals and are usually harmless. They serve as an indicator of contamination of faecal origin. By demonstrating an increased number of these bacteria, the presence of pathogens, which may also occur in the intestines, can not be excluded with sufficient certainty. If none of these faecal indicators are found in the Water, one can assume that there are no harmful bacteria. The pH figure is an indicator for the water quality as long as the figures are in the range of 6 to 9. If the pH figure is outside this range, reddening of the skin may occur to humans. A massive prevalence of algae and especially of cyanobacteria is not only an aesthetic problem. Allergic reactions and other health problems can occur to persons with sensitive skin but symptoms usually decrease after a short time. The chlorophyll of cyanobacteria is measured. From 100 micrograms per liter (ug / l) there is a strong cyanobacteria infection. 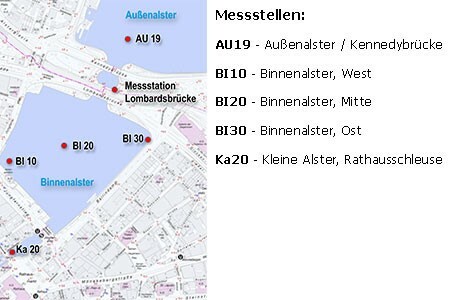 Measurements are being done throughout the Inner and at the end of the Outer Alster. See the map below exact locations.